The Argentina-born Gramatica started out playing soccer and had just one year of high school football prior to college, but proved to have a strong and accurate leg. While he missed a season due to injury, he was an AP first-team All-American in 1997, when he kicked a 65-yard field goal, the longest in NCAA history without use of a tee. Overall, he booted 54 field goals in 70 attempts (77.1 %), 187 of 192 tried for extra points, for a total of 349 points. 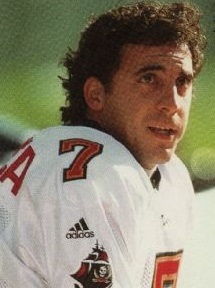 Gramatica was chosen by the Buccaneers in the third round of the 1999 NFL draft and made an immediate impression as a rookie with his reliable field goal kicking, followed by enthusiastic celebrations, although there were concerns about the length of his kickoffs. Buccaneers went 11-5 to finish first in the NFC Central. Won NFC Divisional playoff over Washington Redskins (14-13). Lost NFC Championship to St. Louis Rams (11-6). Gramatica followed up in 2000 by making good on 28 of 34 field goal attempts (82.4 %), five of seven coming from 50 yards or more, and all 42 of his PAT attempts for a total of 126 points. He received first-team All-NFC honors from Pro Football Weekly in addition to being an AP second-team All-NFL selection and was named to the Pro Bowl. While hampered by leg injuries over the next two seasons, he continued to be reliable on field goals inside of 50 yards and led the NFL with a team-record 32 in 2002 while not missing any extra points for the fourth consecutive year. However, his performance dropped off significantly in 2003 and he was let go during the ’04 season, finishing up as a kickoff specialist for the Colts. Injuries that required surgery cost him the entire 2005 season. Signed by the Patriots in ’06, he lost out to Stephen Gostkowski in the preseason and was waived, briefly rejoining Indianapolis and then replacing Mike Vanderjagt in Dallas. He hit on 6 of 8 field goal tries and all 14 PAT attempts but injuries caused the Cowboys to let him go and he spent parts of the 2007 and ‘08 seasons, his last, with the New Orleans Saints. Overall, he was successful on 155 of 203 field goals (76.4 %), with a team-record 137 on 179 attempts coming with the Bucs, and he made good on 228 of 230 PATs for a total of 693 points. 592 of those points were compiled with Tampa Bay, another franchise high. Gramatica was chosen to one Pro Bowl. His younger brother Bill also kicked in the NFL, with the Cardinals and Dolphins.